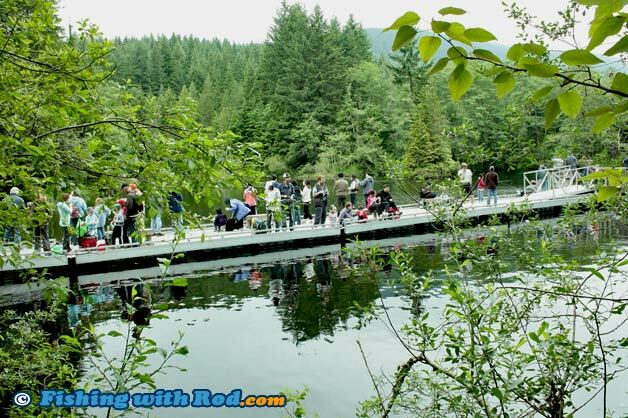 There are many Lower Mainland lakes that have easy foot access and offer good trout fishing for kids during the summer. Rice Lake is one of them. This man-made lake was once used as a reservoir to serve drinking water for North Vancouver residents. Today, it is a wildlife refuge where recreational activities such as fishing can be enjoyed by hundreds of outdoor enthusiasts daily. Rice Lake is located at the Lower Seymour Conservation Reserve in North Vancouver. To get there from Vancouver, drive across Second Narrows Bridge on Highway 1, get off at exit 22. Follow Lillooet Road after the exit as it climbs up the hill. At the end of Lillooet Road, you will reach a gravel road. Continue driving on the gravel road until you reach the entrance of Lower Seymour Conservation Reserve. Park your car at the parking lot, and follow the trail signs to Rice Lake. The walk from the car to the lake is approximately ten minutes. Please note the designated park hours as gate will be closed after these hours. Fishing at Rice Lake is usually good during spring and autumn when the Fraser Valley Trout Hatchery stocks it with rainbow trout. Summer fishing can be done but it is not as productive due to the warm weather. Winter fishing is also possible as long as the lake is not frozen. Accessing Rice Lake can be done with ease as there are numerous trails that lead to the its shoreline. The most popular spot is the fishing dock that is located at the southeastern corner of the lake. It is especially designed for disabled anglers who may have trouble getting on and off a pier. The ramps and benches on the dock provide comfort so all anglers may enjoy what this lake has to offer. Washrooms, picnic tables, shelters can also be found on site, making it a very family oriented recreational facility. Rice Lake is regularly stocked with catchable rainbow trout that can be extremely fun on light tackle. The setup is so easy that anyone can do it. Because these fish are no heavier than 1lb, all you need is an ultralight spinning rod, a small spinning reel spooled with 2 to 4lb test line, a small bobber, a couple of split shots and a No. 4 or 6 hook. For bait, the good old dew worm is always the trout's favorite, but other bait such as deli shrimp, marshmallow, dough, corn will also do the trick. Artificial lures also work for rainbow trout, but you can improve your success rate by using small presentations. Spinners and spoons lighter than 1/8oz work best. Silver bodies with orange or pink stripes seem to work better than other patterns. The only location that is suitable for flyfishing is the float dock where backcasting space is provided. For the class of your flyfishing rod, use 4wt or less. Slowly stripping a dark coloured leech pattern near the bottom is productive. Be sure to watch out for onlookers on the floating dock when casting. Rice Lake is located in Region 2 in the British Columbia freshwater fishing regulations. The Lower Seymour Conservation Reserve is widely used by many recreational users so please respect others and wildlife around the lake by keeping the noise level down and picking up your own garbage.